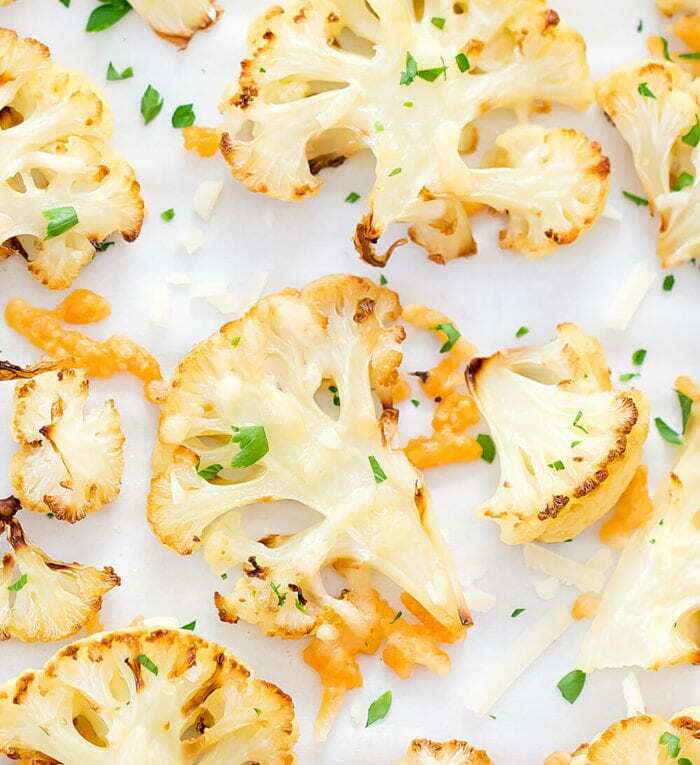 Parmesan Roasted Cauliflower is an easy and flavorful side dish to prepare. It’s one of my favorite ways to eat cauliflower and is a stress-free dish to make on busy weeknights. I’ve made this side dish several times this summer and it’s been such a big time saver. I usually do two pans worth so we have leftovers for the next day as well. I love that I don’t need to hover over my stove while this is cooking too. 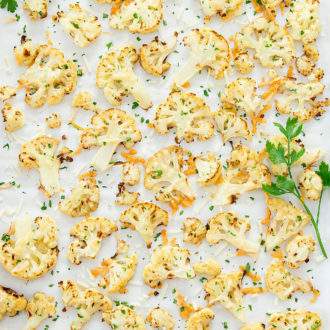 It’s such an easy preparation for cauliflower, but it’s also one of my favorites. When roasted, the cauliflower is caramelized, developing a subtle sweetness that you don’t get when it’s cooked with other methods. To make this dish, all you need is cauliflower, olive oil and parmesan cheese. That’s it! If you want to be a little fancier, you can also add fresh ground black pepper and herbs. Since I’ve made this dish so many times, I’ve tested different variations on roasting temperature, cauliflower size, etc. 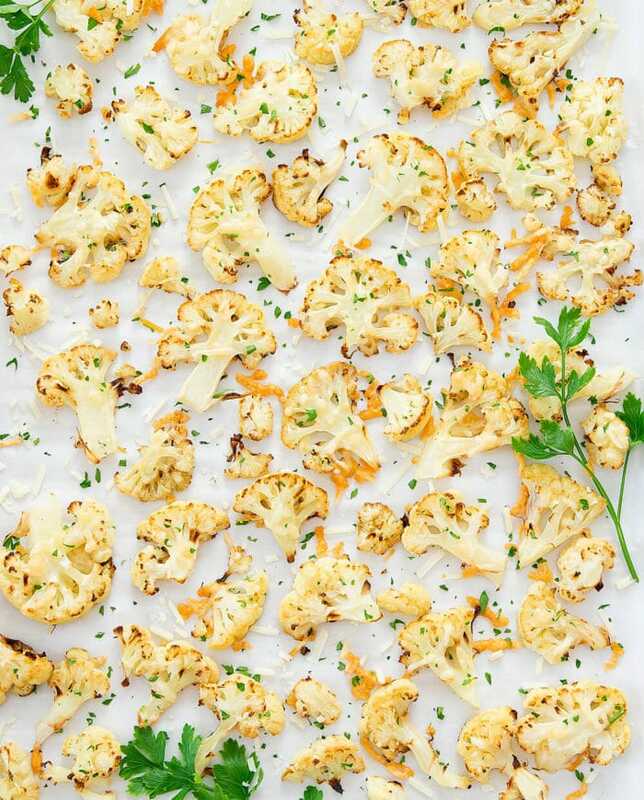 Here are some of my tips for roasting cauliflower. Rather than separating the cauliflower into small florets, it’s best to slice the cauliflower. When you roast round florets, the sections closer to the top of the oven tend to burn before the cauliflower is finished. The sliced florets have a flat surface, which allows for even cooking. Many recipes will tell you to toss the cauliflower in oil. It can be difficult to make sure all your cauliflower is coated in oil and when you toss the cauliflower, usually you end up with a lot of cauliflower crumbs breaking off. 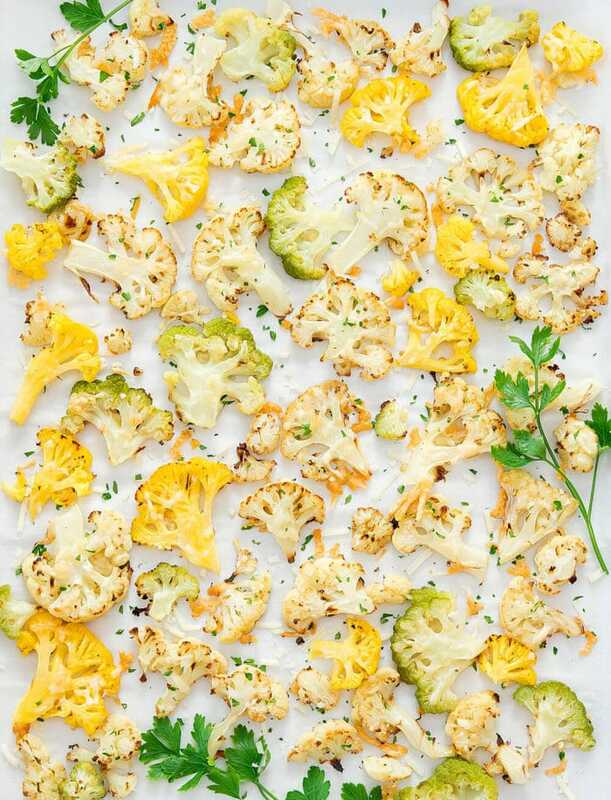 I found that you can use less oil and ensure that all the cauliflower pieces are evenly coated by brushing the cauliflower florets with oil. You do definitely want to make sure you coat the cauliflower in a little oil. If you attempt to roast without the oil, the cauliflower will be too dry. Make sure you wait until the last few minutes before adding the cheese. The florets need about 30 minutes to become tender and caramelized. If you add the cheese at the beginning, the cheese will cook for too long. 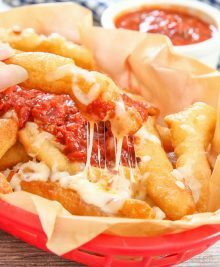 If you don’t like the taste of Parmesan, you can feel free to use other cheeses as well. 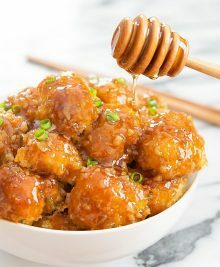 An easy way of cooking cauliflower and also one of my favorites! The cauliflower is roasted until caramelized, bringing out a subtle sweetness, and then topped with melty parmesan cheese. 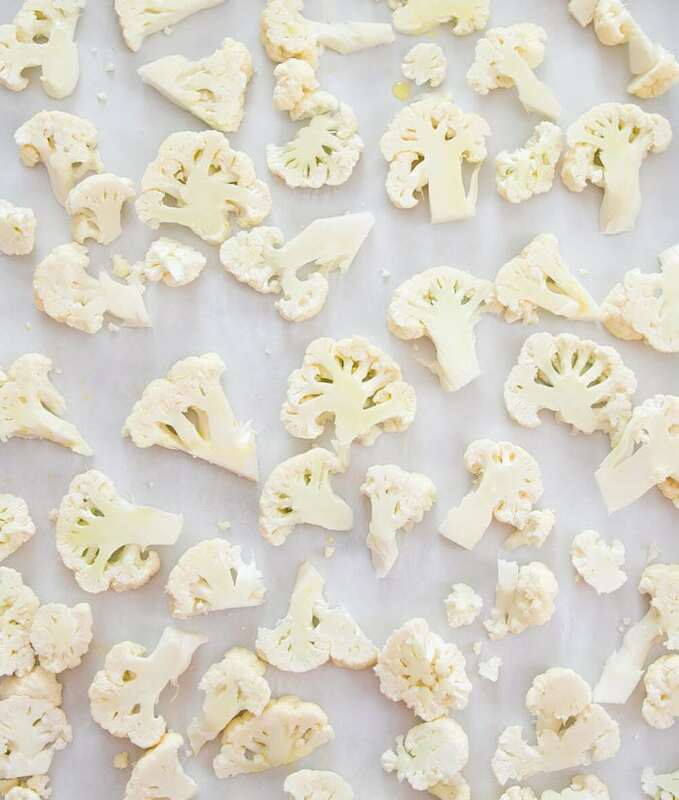 Place cauliflower in a single layer onto baking sheet. Brush surface of cauliflower with oil. Flip cauliflower over and brush with oil. 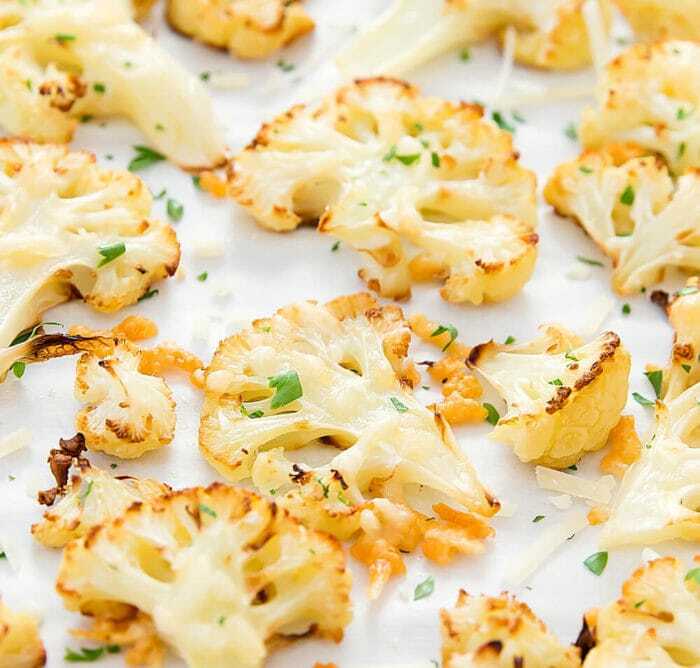 Place cauliflower into the oven and cook for about 30 minutes or until cauliflower is tender and edges turn a light brown. 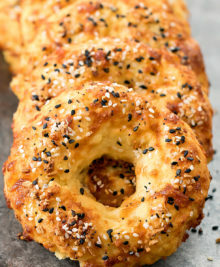 Sprinkle cauliflower with cheese. Place back into the oven and cook for about 10 minutes or until cheese is melted and begins to bubble. Top cauliflower with fresh ground black pepper if desired. Garnish with chopped parsley if desired. 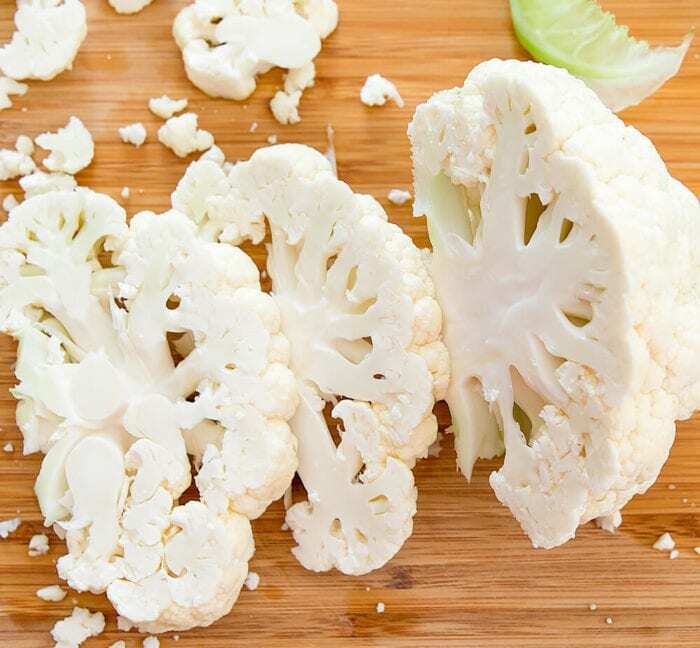 Rather than separating the cauliflower into small florets, it’s best to slice the cauliflower (see photo above for reference). When you roast round florets, the sections closer to the top of the oven tend to burn before the cauliflower is finished. The sliced florets have a flat surface, which allows for even cooking.